Briella Doherty, 10, of Portland will compete along with Hans-Erik Jerosch, 13, of Yarmouth as the U.S. Figure Skating Championships get underway in Detroit on Friday. FALMOUTH — They understand they have no chance at a medal. That won’t stop Briella Doherty of Portland and Hans-Erik Jerosch of Yarmouth from having a blast at the U.S. Figure Skating Championships, which get underway Friday at the Detroit Figure Skating Club. Briella, 10, and Hans, 13, are taking a break from their busy ice hockey schedules in order to compete as juvenile pairs Friday afternoon. Briella appears to be, by roughly seven months, the youngest figure skater from Maine ever to qualify for nationals. Briella and Hans both play defense, shoot left and wear the same uniform number (3) for Casco Bay Hockey Association teams. She started skating at 2 but picked up hockey only two years ago. He also started skating at 2, but stuck to pucks for six years before dipping his toe into a boot with jagged teeth on the blade front. This season marks their third as a figure skating tandem, coached by Briella’s mother, Kristin Andrews, who also gives power skating instruction to hockey players. Andrews also coaches Hans’ older brother, Franz-Peter Jerosch, 17, who partnered with Jade Hom of Massachusetts to win the novice pairs national championship last winter in San Jose, California. Jerosch and Hom have moved up one level to juniors and were scheduled to compete in Detroit but pulled out Thursday because Hom has a leg injury. 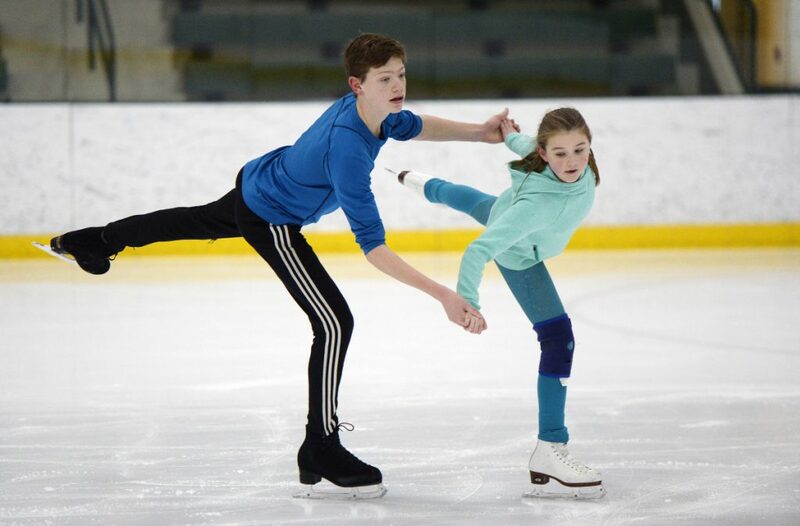 Yarmouth’s Hans-Erik Jerosch, 13, and 10-year-old Briella Doherty of Portland practice their routine recently at Family Ice Center in Falmouth in preparation for the U.S. Figure Skating Championships this weekend in Detroit. By about seven months, Briella appears to be the youngest figure skater from Maine ever to qualify for nationals. Hans was in San Jose last winter to see his brother skate at nationals, so he said the environment will be familiar. Off the ice, Hans plays piano and French horn and in spring plans to run track. At 5-foot-7, he’s nearly a foot taller than Briella, who stands 4-8. She plays soccer and the violin, and is the more outgoing of the two. Her mom says Briella could make friends with a wall. 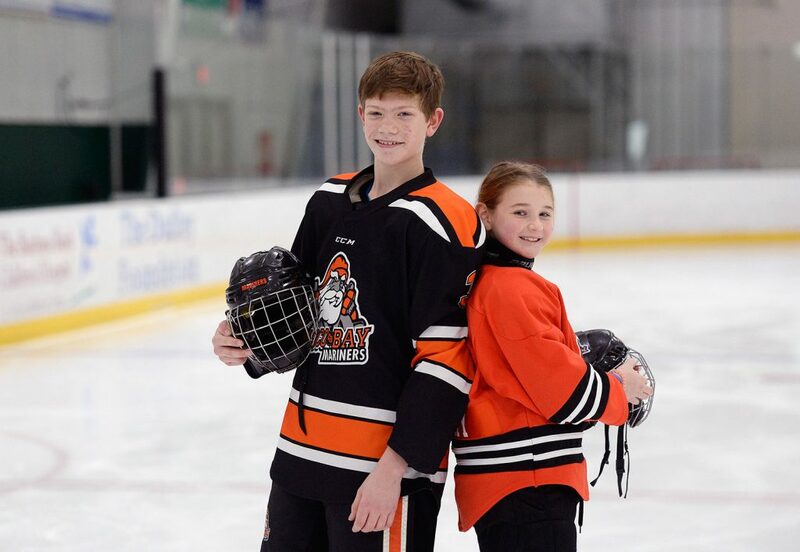 On a day when they practiced their figure skating, Hans-Erik Jerosch, 13, and Briella Doherty, 10, put on their hockey gear at Family Ice Center in Falmouth. The hockey players are competing in the U.S. Figure Skating Championships. They qualified for nationals in November by placing fourth at the Eastern Sectionals in Wake Forest, North Carolina, where, because of injuries, there were only three other teams in juvenile pairs. Skaters up to age 16 are allowed to compete at the juvenile level. Of the other 11 pairs who will compete against Hans and Briella at nationals, each scored at least 38 points at sectionals around the country. In seven competitions over two seasons, the pair from Maine has yet to surpass 28 points. In Detroit, they are hoping to reach 30. This could be their only shot at nationals for a while. Beginning with the 2019-20 competitive season, the USFSA will use a new format that funnels the best juvenile, intermediate and novice skaters to high performance camps and development teams rather than sending them to a national competition.